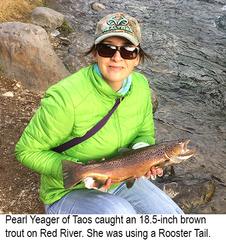 Red River: Pearl Yeager of Taos caught an 18.5-inch brown trout this past week. She was using a Rooster Tail. 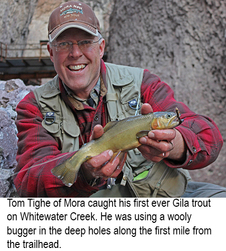 Whitewater Creek: Tom Tighe of Mora caught his first ever Gila trout Dec. 1. He was using a wooly bugger in the deep holes along the first mile from the trailhead. Cimarron River: Stream flow below Eagle Nest on Monday morning was 6.78 cfs. We had no reports from anglers this week. Eagle Nest Lake: As of Monday morning, a good deal of the lake was covered with thin ice and snow causing the lake to be not accessible for bank fishing. For ice updates, call the state park office at (575) 377-1594. Lake Alice: There is a thin layer of ice on the lake and it is closed to fishing at this time. Lake Maloya: Trout fishing was good using PowerBait. Fishing pressure was light. Monastery Lake: Fishing was good using Fire Balls, PowerBait and copper John Barrs for trout. A reminder to anglers that ice fishing is not permitted at this lake. Pecos River: Stream flow near the town of Pecos on Monday morning was 30.1 cfs. Fishing in the Villanueva area was good using copper John Barrs and PowerBait for trout. Red River: Stream flow below the hatchery on Monday morning was 34.0 cfs. Trout fishing below Questa was good using Fire Balls, PowerBait, copper John Barrs and spinners. Rio Grande: Stream flow at the Taos Junction Bridge was 279 cfs. Trout fishing was fair to good using wooly buggers, San Juan worms, Kastmasters, worms and salmon eggs. We had no reports on other species. Rio Hondo: Stream flow on Monday morning near Valdez was 6.89 cfs. We had no reports from anglers this week. Rio Mora: Stream flow near Terrero on Monday morning was 6.29 cfs. Trout fishing was slow. Fishing pressure was very light. Rio Pueblo: Stream flow near Penasco on Monday morning was 6.11 cfs. We had no reports from anglers this week. Storrie Lake: Fishing was fair using PowerBait and Fire Balls for trout. We had no reports on other species. Ute Lake: Fishing was fair to good using blade baits and spoons at 30 to 40 feet for white bass. Anglers fishing for white bass also caught a few walleye. We had no reports on other species. Fishing pressure was very light. The surface water temp was in the high 40s. Abiquiu Lake: Fishing was fair using crank baits for walleye and trout. Fishing pressure was extremely light. Anglers should be aware that the boat ramp is in rough shape and four-wheel drive has been recommended for launching boats. Animas River: Water flow below Aztec on Monday morning was 220 cfs. We had no reports from anglers this week. Albuquerque Area Drains: Fishing on the Albuquerque, Belen and Peralta drains was good using salmon eggs, PowerBait and wax worms for trout. We had no reports on other species. Bluewater Lake: As of Monday morning, about 50 percent of the lake was covered with ice. There was some open water fishing access on the west side. Chama River: Monday morning flows below El Vado and Abiquiu were 31.6 cfs and 76.8 cfs respectively. Trout fishing below El Vado was good using salmon eggs, night crawlers, PowerBait and San Juan worms for brown and rainbow trout. Trout fishing below Abiquiu was fair using small streamers, worms and salmon eggs. Fenton Lake: As of Monday morning, the lake was completely frozen over and unsafe for ice fishing at this time. For updates, call the state park office at (575) 829-3630. Jackson Lake: Fishing was fair using PowerBait for trout. We had no reports on other species. Jemez Waters: Stream flow on the Jemez near the town of Jemez on Monday morning was 11.0 cfs. We had no reports from anglers this week. Navajo Lake: Kokanee snagging was slow. Fishing was slow with just a few trout and northern pike reported. The trout were caught by anglers using Fire Balls, salmon eggs and PowerBait and the two pike reported were taken with swim baits. San Juan River: Stream flow below Navajo Lake on Monday morning was 289 cfs. Fishing was good using small bead head pheasant tails, RS2s, red annelids, red larva and small egg patterns for brown and rainbow trout. There have been some decent baetis hatches coming off on the cloudy afternoons. Through the bait waters, trout fishing was fair to good using night crawlers, salmon eggs, wax worms, copper John Barrs and small gold spoons. Tingley Beach: Fishing was very good using small spoons, wooly buggers, PowerBait, worms and salmon eggs for trout. We had no reports on other species. Alumni Pond: Fishing was very good using PowerBait and salmon eggs for trout. We had no reports on other species. Bill Evans Lake: Fishing was good using Pistol Petes, salmon eggs and PowerBait for trout. Caballo Lake: Fishing remained slow for all species with just a few walleye caught by anglers using jig and grub combinations. Elephant Butte Lake: Fishing for catfish was fair using cut bait, liver and homemade dough bait. Fishing for white bass was fair using blade baits. We had no reports on other species. Escondida Lake: Fishing was good using spoons, PowerBait, corn and salmon eggs for trout. 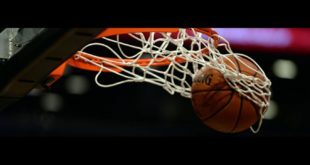 Gila River: Stream flow on Monday morning was 87.9 cfs. We had no reports from anglers this week. Lake Roberts: Fishing was good using PowerBait and Fire Balls for trout. We had no reports on other species. Rio Grande: Stream flow below Elephant Butte Monday morning was 0.57 cfs. We had no reports from anglers this week. Young Pond: Fishing was very good using PowerBait for trout. Alto Lake: Fishing was very good using PowerBait for trout. Isaiah Chavez reported catching his limit including a 19-inch rainbow. We had no reports on other species. 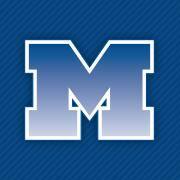 Black River: Stream flow at Malaga on Monday morning was 13.0 cfs. Fishing was slow for all species. Blue Hole Park Pond: Fishing was good using PowerBait, homemade dough bait and Fire Balls for trout. We had no reports on other species. Bosque Redondo Lake: Fishing was good using PowerBait and Fire Balls for trout. We had no reports on other species. Brantley Lake: Fishing was slow to fair using jig and grub combinations and spoons for white bass and largemouth bass. We had no reports on other species. Carlsbad Municipal Lake: Fishing was fair using PowerBait and small spoons for trout. We had no reports on other species. Chaparral Park Lake: Fishing was slow to fair using PowerBait for trout. El Rito Creek: Fishing was very good using PowerBait, Fire Balls and copper John Barrs for trout. Eunice Lake: Fishing was good using PowerBait for trout. We had no reports on other species. Green Meadow Lake: Fishing was good using small spoons, PowerBait and salmon eggs for trout. Greene Acres Lake: Fishing was very good using PowerBait for trout. Grindstone Reservoir: Fishing was very good using PowerBait, worms and salmon eggs for trout. Several limits of trout were taken. We had no reports on other species. Jal Lake: Fishing was fair to good using PowerBait for trout. Lake Van: Fishing was good using PowerBait and salmon eggs for trout. We had no reports on other species. Oasis Park Lake: Fishing was good using PowerBait for trout. Pecos River: Stream flow below Sumner Lake on Monday morning was 15.1 cfs. Fishing was good using PowerBait and worms for trout. We had no reports on other species. Perch Lake: Fishing was very good using PowerBait, salmon eggs, wooly buggers and Pistol Petes for trout. We had no reports on other species. Ruidoso River: Stream flow on Monday morning at Hollywood was 5.82 cfs. Fishing was good Fire Balls for trout. Sumner Lake: Fishing was slow for all species. Previous The final story, my name has been cleared!